Predicting who will win the Alabama quarterback job is risky business. Most pundits misfired when picking Jake Coker over Blake Sims in 2014, and Coker’s camp victory over Bateman last season was short-lived. While Bateman has a big edge in playing experience, beating out Barnett — a former five-star prospect recruited by Lane Kiffin — will be mighty tough. So long as Scarbrough leaves his eligibility and injury troubles in the past, he’s the favorite to take Derrick Henry’s role in the offense. There’s no question he has the talent to become Alabama’s next superstar. Harris made good contributions to the Tide in 2015, and will likely take a chunk out of Scarbrough’s workload. Factoring in O.J. Howard (see below), there probably is not a better receiving corps in the country. These guys will make life a little easier for Barnett and Bateman. Ridley is a star in the mold of Julio Jones and Amari Cooper. Can he build on an outstanding freshman season? Stewart broke out of an early-season slump to deliver several important grabs. And Foster — the No. 1 wideout before tearing his rotator cuff against Ole Miss — will see plenty of targets if opposing teams pay more attention to his teammates. Howard’s national championship performance was stunning to many. It’s not that people didn’t think he was capable of a 200-yard day; it’s that Alabama had neglected him as a receiving option for much of the season. Howard’s talents are in the open now, and he’ll provide a potential All-American receiving option for the Tide quarterbacks when Ridley and Co. are locked down. If Baldwin — a four-star JUCO transfer from Ontario — can impress early, he could take Greene’s starting spot. Williams — a five-star commit — is Alabama’s highest-rated early enrollee, though a redshirt could be in order if the coaching staff feels confident about its more experienced players. Robinson (sprained knee) had a spotty 2015. If he’s healthy, he has a strong chance to fill Ryan Kelly’s role as the Crimson Tide’s best lineman. Pierschbacher went from no-name to the glue holding Alabama’s line together in 2015. When Ryan Kelly went down with a concussion, Pierschbacher was the primary interior lineman in charge of plowing holes for Derrick Henry. Even with Kelly on the field, Pierschbacher stood out as one of the Tide’s best second-year players. Petitbon, a redshirt freshman, could be the “new” Pierschbacher if an opportunity opens up in front of him. Despite the loss of award-winning senior Ryan Kelly, Alabama’s line should be in good shape next season. Hassenauer got some valuable experience filling in for Kelly, and there are a plethora of backup options besides Kennedy (guard depth) if the Wetumpka, Ala., native can’t hold down second string. Strength is key across the Alabama defensive line, but especially here. Payne’s brute force led to a breakout freshman year, and Frazier (6-foot-4, 315 pounds) is just as able to clog things up when his number gets called in the rotation. Allen surprised many when he announced his return. Thought to be a first-round NFL prospect, he claimed to have received a second-round grade, and will continue terrorizing SEC quarterbacks this season. Playing 3-4 end in Alabama’s defense requires a blend of girth and agility. For example: Could you imagine 312-pound A’Shawn Robinson as a 4-3 pass rusher? No, but he was an adept space-clogger for the Tide. Williams, a 6-foot-4, 265-pound high-school tackle, will probably fit well into Alabama’s vaunted defensive line rotation. With the departure of Reggie Ragland, Foster is freed up to be the next great Alabama linebacker. “When you think about Rolando McClain and Dont’a Hightower and C.J. Mosley, the next in line is Reggie Ragland, and then Reuben Foster next year will be a first-round possibility,” Kiper said last week. “I think it was smart for him to go back and be the leader of that defense as Reggie Ragland was.” Dion Hamilton was a stealthy contributor this past season, racking up 27 tackles, including 1.5 for loss. Williams and Anderson both had opportunities to go pro, but their return makes outside ‘backer one of the team’s deepest position groups. Counted on to rush the quarterback several times a game, this spot is crucial in passing situations. Williams was one of the country’s best at getting into the backfield, and fans should keep an eye on Brown, a second-year player with a 6-foot-5 NFL frame. Along with safety Ronnie Harrison, Humphrey and Fitzpatrick were two of the team’s biggest surprises in 2015. The pair of freshmen were forced into serious pressure situations throughout the year, and while they didn’t hold up terribly well against Clemson, they made enough plays to help Alabama to a five-point win. Brown is currently suspended from the team after winding up deep in Saban’s doghouse. His potential reinstatement would be a boon for this unit, which often requires three players on the field at the same time for its “STAR” package. Another deep position group, safety should be a strength for the Tide. Jackson collected six picks throughout the season, also proving to be a big help in run support (46 tackles). Meanwhile, Harrison learned the ropes and showcased his physical style. If he can leave some freshman errors behind him, teams will think twice before going up top against the Tide. With prized recruit Eddie Pineiro out of the picture, Griffith will be able to kick without looking over his shoulder in 2016. He finished the year strong, making 23 of his final 28 field goals, and continued to provide a strong leg on kickoffs. After an excellent freshman season, Scott was much shakier in 2015. His 44.2 average won’t raise any red flags, but Scott drilled at least one 50-yard punt in 11 of the final 12 games — meaning several sub-40 kicks dragged his average down throughout the year. Count him out if he becomes the featured back, but Harris returned nine kicks in Kenyan Drake’s absence this season. He could certainly fill Drake’s role as speedy returner and complementary runner. Cyrus Jones handled nearly every punt return this past season, with fellow senior Richard Mullaney picking up the scraps. So, who’s next? That’s anyone’s guess, but we’ll go with Charlot, a receiver who fits the short, speedy mold that Saban tends to gravitate toward. After the 2014 season, the Crimson Tide saw the departure of three of their top receivers. With several underclassmen filling up the depth chart, the team needed some experience and leadership at the position. That problem was solved with the addition of graduate-transfer Richard Mullaney from Oregon State. 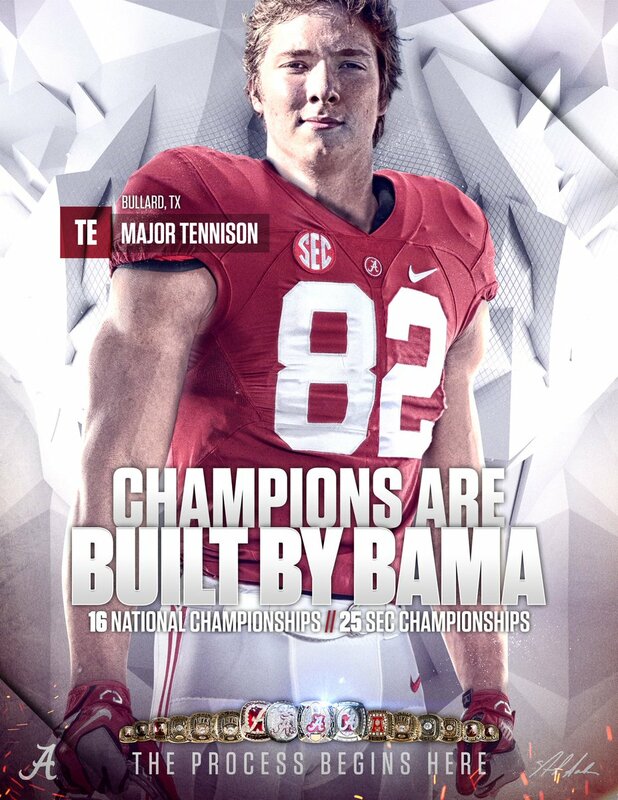 Alas, Bama fans would only get to enjoy the skills of Mullaney for one season. Now the Tide faces a similar situation. But catching the ball is not the only thing Mullaney is good at. He is a darn good recruiter too. Bowling Green's Gehrig Dieter has announced via Twitter that he will grad-transfer to Alabama for 2016. And Bama fans have Mullaney to thank in part.Dieter's college career didn't start out quite the way he expected. Originally from South Bend, Indiana, Dieter broke the state records for receiving yards in a season (2,171) and career (4,326). He also set the national single-game record with 437 receiving yards in 2011. As a three-star receiver, he chose to attend SMU over Kansas, Arkansas State and a host of MAC schools. He got a leg up on the competition as an early enrollee but only caught 10 balls for 168 and a score his freshman year. He decided to transfer back closer to home to be reunited with his older brother, Nolan Dieter, who was a back-up quarterback at Bowling Green. After sitting out a season, he grabbed 35 balls for 460 yards and a score in 2014. Dieter opened his 2015 campaign with seven catches against Tennessee for 133 yards and a touchdown. He had double-digit receptions against Purdue, Toledo, and Ball State as well as at least six pass catches in nine games last season. On the season, he hauled in 94 catches for 1,033 yards and ten touchdowns. However after a 10-3 season, BGSU coach Dino Babers left for the head job at Syracuse. Once again, Dieter was faced with a reevaluation of his situation. The redshirt junior considered entering the NFL Draft but after talking it over with the people around him, he decided he needed another year to hone his skills. One person in particular was a receiver nicknamed "Slotty Pippen". Last season, the former Beavers wide receiver Richard Mullaney made a similar move as a graduate transfer to Alabama. He finished the season with a national championship and 38 catches for 390 yards and five touchdowns. Dieter has been in contact with Mullaney and Alabama wide receivers coach Billy Napier to discuss how the transition will work out for him. Dieter is set to graduate from Bowling Green in May and then he will have one season of eligibility remaining in 2016. He is a Dean’s list student, but will still need to get a waiver to become eligible. He told FOX Sports on Saturday, "we talked to the compliance people here and they felt pretty confident about (getting) the waiver. He said there have been like 45 people in my situation and they’ve all gotten approved." Dieter, who also considered Wake Forest, said he will take a visit to Alabama this week. The Tide has another weapon for Lane Kiffin to utilize. Finally, something goes right for Alabama! verdammt gute Übersicht, chapeau. Ein erhebliches MAnko ist für die Zukunft natürlich Kirby Smart. Pruitt mag zwar auch seine Qualitäten haben, aber Smart war schon eine Klasse für sich. War für mich auch immer der legitime Saban Nachfolger und ich hoffe, sollte CNS irgendwann Tuscaloosa verlassen, dass Smart zurück kommt und übernimmt. Dass Smart Coach Cochran nicht loseisen konnte und er bei der Tide bleibt ist meiner Meinung nach sehr wichtig, da Cochran der "hot leader" des Teams ist. Bezüglich der Aufstellung denke ich, dass Rashaan Evans starten wird. Bei Tony Brown sagt mir mein Gefühl, dass er leider nicht mehr lange beim Team bleibt. Ansonsten muss ich mich jetzt nochmal einlesen, um zum Rest meinen Senf dazu zu geben. Starting Left Tackle Cameron Robinson wurde zusammen mit einem weiteren Alabama-Spieler in Louisiana verhaftet. Beide Spieler waren in einem Auto unterwegs und führten jeweils eine Waffe bei sich, die von Robinson war allerdings als gestohlen gemeldet... Außerdem wurde Marihuana im Auto gefunden. In Louisiana drohen Robinson mindestens fünf Jahre(!) Haft, wenn er wegen des illegalen Führens einer Waffe in der Gegenwart von Betäubungsmitteln angeklat wird. Dieser Strafbestand stellt eine schwere Straftat ("felony") im Bundesstaat Louisiana dar. Da er bislang noch nicht strafrechtlich in Erscheinung getreten ist, ist es durchaus möglich, dass er aufgrund eines geringeren Straftatbestands angeklagt wird und mit einer Verurteilung für ein geringfügiges Vergehen ("misdemenaor") davon kommt. Vorerst keine Anklage gegen Robinson und seinen Teamkollegen, da die Beweislage nicht ausreichend ist, um Anklage zu erheben. Es wurden eine gestohlene Waffen und Gras festgestellt und das ist nicht ausreichend für eine Anklage? Da greift man sich auf den Kopf. Vielleicht wurden Fehler bei der Durchsuchung des Wagens begangen, die Beweismittel unzulässig gemacht haben oder es gab keinen ausreichenden Verdacht, um den Wagen überhaupt untersuchen zu dürfen. Anscheinend konnte die gestohlene Waffe auch nicht eindeutig einem der beiden zugeordnet werden. Warum dann beide so ganz straffrei für den Drogenbesitz davon kommen, erschließt sich mir auch nicht. Head Coach Nick Saban war nach diesem Match sehr enttäuscht. "I don't know that I've ever been this disappointed after winning a game, maybe ever," he said. "We have lots of work to do. We're going to play a lot better teams. Eines der besseren Teams ist wohl definitiv Ole Miss. Am Samstag um 21:30 deutscher Zeit trifft also Alabama auf die Ole Miss in Oxford. 2014 (23–17) und 2015 (43–37) konnte Ole Miss das Spiel für sich entschieden, bedeutet seit 2 Jahren konnte man gegen Ole Miss nicht mehr gewinnen. Beide Niederlagen waren sehr bitter, waren die ersten und blieben auch die einzigen in der jeweiligen Season. werden sich die Rebels sehr wahrscheinlich von den Playoffs verabschieden können falls das Spiel gegen Alabama ebenfalls verloren geht. Gewinnen Sie jedoch wird man Sie im Ranking vorerst weit vorne antreffen. Also mehr als genug Motivation für Ole Miss das Spiel zu gewinnen. Die Finish-Qualitäten sowie die Konzentration und Ernsthaftigkeit hat mir besonders im letzten Spiel gegen Western Kentucky gefehlt. Auch die O-line muss sich ebenfalls deutlich steigern im Vergleich zu dem letzten Spiel, denn hinter der Line steht mit Jalen Hurts und wohl möglich Blake Barnett jeweils ein Freshman-QB. Laufspiel: Weder Freshman B.J. Emmons noch die beiden Sophomores Damien Harris & Bo Scarbrough sind bisher groß in Erscheinung getreten. Die Leistung der Defense rund um Jonathan Allen ist bisher sehr anschaulich. Die Abgänge Jarran Reed and A'Shawn Robinson konnten mit Da'Shawn Hand & Dalvin Tomlinson bisher gut kompensiert werden. Jalen Hurts gefällt mir hinter einer noch etwas schwächelnden O-Line bisher sehr gut, starker Arm - sehr mobil. Ein konzentrierter und aufmerksamer Jalen Hurts gepaart mit einer schützenden O-Line. - Jung und sehr unerfahren, ein kleiner Fauxpas ist ihm schon passiert - auch völlig normal, jedoch für ein Gegner wie Ole Miss ein gefundenes Fressen. Er muss in diesem Spiel von Beginn an hellwach sein genauso wie die O-Line. - Die Läufe von Jalen Hurts waren zwar bisher sehr vielversprechend aber auch stets gefährlich besonders gegen ein Team wie Ole Miss muss Hurts aufpassen. Hier müssen endlich die talentierten RB's zeigen was sie können und warum nicht gleich gegen eine starke Defense von Ole Miss? Sehr viel Druck auf QB Kelly ausüben. - Die Qualität von Kelly sollte Alabama bekannt sein. Daher früh und oft Kelly unter Druck setzen dann wird er Fehler machen und die Chancen auf ein Sieg steigen enorm. Big Plays von Ole Miss unterbinden. - Ole Miss ist bekannt für Big Plays die hauptsächlich druch die Pässe von Kelly erzeugt werden. Hier muss das Defensive Backfield mit rund um Minkah Fitzpatrick und Marlon Humphrey sowie Eddie Jackson eine Top-Leistung abrufen und die Plays mit aller Macht unterbinden. - Im letzten Viertel früh den Sack zu machen. Viele Experten sind der Meinung das es hier wohl auf einen Drahtseilakt hinausläuft. Deshalb am besten von Beginn an versuchen den Rebels gleich klar zu machen wer hier das stärkere und bessre Team ist. und tippe ganz frech im Gegensatz zu vielen Experten auf einen lang ersehnten, überaus deutlichen und überzeugenden Blowout-Sieg für Alabama Crimson Tide - jedenfalls wünsche ich mir das! Erstmal danke für die Zusammenfassung, sehr informativ! Ich finde sogar hier untertreibst du fast ein wenig Die Defense könnte besser sein als die im vergangenen Jahr. Wenn man sich mal reinzieht, wie viele Playmaker allein schon in der Front-7 zu finden sind: Neben den von dir angesprochenen Allen (sicher einer der besten CFB-Defender momentan), Hand und Tomlinson mein einer kleiner Favorit Tim Williams (diesen first step muss man einfach lieben, der OT ist sofort in der Defensive, das Bending um den Liner rum ist erstklassig und für einen undersized Speedrusher hat er eine erstaunliche Anzahl an effektiven Moves), der gerade bezüglich der Run-D etwas vielseitigere, aber weniger big play affine OLB Ryan Anderson sowie der schon im letzten Jahr spektakuläre playmaking LB Reuben Foster (mein zweiter Liebling). Wenn man in der Secondary dann noch den wohl besten S Eddie Jackson und den momentan in überragenden Form befindlichen CB Marlon Humphrey (der gegen USC-WR Juju Smith-Schuster nichts - aber auch wirklich gar nichts zuließ) aufbieten kann, wohin wird die Reise da wohl gehen? Die meisten der genannten Spieler spielten ja letztes Jahr schon eine gewisse Rolle, aber insb. die Entwicklung von Marlon Humphrey ist ja absolut sensationell! Die CB-Position war relational in der Defense ein eher größeres Fragezeichen, und dann entwickelt man 'einfach' mal wieder einen Lockdown-Corner, der es wohl mit den meisten FBS-WR aufnehmen kann. Muss man schon den Hut vor ziehen. Sehe ich genauso. Kelly ist ein Gunslinger im guten wie im schlechten - Pressure führt möglicherweise auch mal zu einem Rebels-Big Play (gerade mit den großen Fast-Husker-WR Stringfellow und Adeboyejo), aber die Chancen auf entscheidende Turnover steigen doch exorbitant. Gehe - natürlich - auch von einem Bama-Sieg aus. Ich hatte eigentlich vor noch ein kleinen Bericht zu diesem herrlichen Spiel zu schreiben aber aus zeitlichen Gründen werde ich das leider nicht schaffen. Ich war das ganze Spiel über ziemlich nervös, es hatte seine Tiefen und Höhen, es war teilweise komplett verrückt und schließlich war ich am Ende fix und alle. Unzweifelhaft ein großartiges Spiel und für mich ein Spiel das man gesehen haben sollte! "This kind of behavior is not condoned in our program," Saban said, via Alabama Athletics. "We are currently in the process of reviewing all of the information. Once we have a complete understanding of the situation, we will determine what we need to do in terms of the appropriate discipline." "We received word this afternoon that Blake Barnett has officially withdrawn from school and is no longer with our program," Saban said in a written statement. "The quarterback position is a very unique position where only one player can play. We are very disappointed any time a player leaves the program who feels he can compete for a starting position elsewhere, rather than here at Alabama. We wish Blake the very best of luck in the future." Die Highlights von den beiden letzten Spielen gegen Kent State und Kentucky. 5-Star LB Dylan Moses (Rank 5 on ESPN 300) hat sich für die University of Alabama entschieden. Mit Dylan Moses, Najee Harris RB und Alex Leatherwood OT haben die Crimson Tide nun 3 Spieler aus den Top 10. --> Eddie Jackson fractured his leg and will miss rest of season. the University Of Alabama for the best four years of my life I learned and grew a lot now it's time to help coach my boys up and finish this thing...God Is In ControlRTR!! Natürlich extrem bitter. Hier verliert das Team ein Leader und Playmaker in der Defense. Ein 3-Star Recruit und Anfangs noch als Cornerback eingesetzt, hat er sich zu einem der besten Safeties im Trikot der Crimson Tide hochgespielt. In die Fußstapfen von Eddie wird wohl CB Minkah Fitzpatrick treten. Auf der Position von Fitzpatrick wird dann DB Tony Brown spielen. Deep Balls werden meist absichtlich etwas weiter geworfen um ein Turnover zu vermeiden. Freshman hin oder her, bei Passempfängern wie Ridley, Foster, Stewart oder auch TE Howard darf man gerne etwas riskieren. Nette Übersicht und aktuelle Einschätzungen zu den bisherigen Alabama commits aus der 2017 recruiting class. Besonders gespannt bin ich auf Najee Harris und Alex Leatherwood. Beide haben noch nicht zu 100% zugesagt. Dylan Moses dagegen spielt laut eigener Aussage nächstes Jahr definitiv für die Crimson Tide! Bye Week vorüber, am Samstag geht es endlich wieder weiter für die Crimson Tide und zwar gegen die LSU! man hat bei dieser Alabama DL das Gefühl, dass die LOS sich während des Plays nach hinten verschiebt. Mein persönlicher Favorit ist Alex Leatherwood. 6-foot-6, 330 pounds und wird sehr wahrscheinlich schon in der kommenden Season als Left Tackle eingesetzt werden. Was man hier leider vergeblich sucht ist ein 4- oder 5-Star CB. Für Marlon Humphrey hätte ich mir schon gerne ein würdigen Ersatz gewünscht. "We obviously try to identify needs that we have each year and I think in this class we sort of hit every spot but one," Saban said. "We wanted to recruit at least one corner, maybe two. It just worked out that it didn't happen that way for us." PS: Es ist immer spannend zu beobachten, wie Alabama es jedes Jahr schafft, an die 25 Spieler zu signen. Sark to be named Falcons new offensive coordinator. TIFWIW. Heute für mich das heiß ersehnte Spring Game der Crimson Tide. Zu sehen auf ESPN (ESPN Player) um 21 Uhr deutscher Zeit. Am Dienstag wurde bekannt gegeben das Nick Saban seinen Vertrag um weitere 3 Jahre verlängert hat, somit bleibt er bis einschließlich 31 Januar 2025 Coach der Crimson Tide. Zu Vertragsende wird Saban also 73 Jahre alt sein. On Tuesday, the University of Alabama Board of Trustees’ compensation committee agreed to pay Nick Saban $11.125 million this season under a three-year contract extension that includes a $4 million signing bonus. In each year of the deal, Saban's base salary will be $245,000 and his talent fee will be $6.48 million. The contract-year completion payments will vary. $7.125 million in 2018, including a $400,000 contract-year completion payment. $7.525 million in 2019 and again in 2020, including contract-year completion payments of $800,000. $10.325 million in 2021, including a contract-year completion payment of $3.6 million. $7.125 million in each of the deal's final three years, during which each contract-completion payment is scheduled to be $400,000. was ist eine talent fee? Die Universität von Alabama ist eine staatliche Bildungseinrichtung und dadurch gibt es AFAIK Grenzen für das Gehalt des Footballcoaches. Deswegen liegt das Grundgehalt von Nick Saban auch nur bei $245.000 pro Jahr. Durch die "talent fee" kann sein Gehalt diesen Betrag weit übersteigen. Die Trainer werden damit z.Bsp. für ihre Auftritte in den Medien oder Werbung, die die Universität mit ihnen betreibt, entlohnt. Diese "talent fee" wird dann in der Regel u.a. durch TV-Gelder von der Liga (SEC), Sponsoren und Spenden finanziert und nicht durch die Universität selbst. Report: Lane Kiffin Was Famously Chewed Out By Nick Saban For Calling His Players "Dumb"
Die Quellenskepsis ist im Artikel direkt enthalten, aber ich wills einfach glauben. “This type of behavior is not acceptable and we are disappointed in Da’Shawn’s actions,” Saban said in a statement. Sehr blöde und unverständliche Aktion, besonders als Senior sollte einem das nicht passieren. 2014 als Top 10 Recruit zu den Crimson Tide gekommen und für diese Saison als Starter und Leistungsträger in der Defense eingeplant. Er wird wohl, gerade wegen seines Talents und seinen bisherigen Leistungen eine zweite Chance bekommen. Wird Zeit das die Saison wieder beginnt, dann können sich die Jungs wieder voll und ganz auf den Football konzentrieren. “Da’Shawn put himself in a bad situation, obviously made a mistake being where he was at the time,” Saban said following practice Thursday. “But the fact that he didn’t drive the car — which is what we tell the players not to do. It’s not OK with me that he was drinking, and that’s a behavioral issue that needs to be addressed and we will address it. “I could punish the guy for putting himself in a bad situation, but making a pretty good decision after he put himself in that situation,” Saban said, “or we could take the situation that he put himself in — which was drinking — and have him assessed for that and try to help him so that he can make better choices and decisions for the future. Die Entscheidung finde ich richtig und kann ich auch nachvollziehen. Ein Coach kann seine Spieler sehr gut einschätzen und wenn er der Meinung ist keine Strafe aussprechen zu müssen, dann wird das schon der richtige Schritt sein.